For genealogy, city directories provide two types of resources. One part is to locate the address where an ancestor lived for a specific time. The second resource is for the insight into the community and neighborhood in which they live. In addition to a directory of the city residents, city directories list the various trades and businesses that service the city, as well as clubs, lodges, fraternities, churches, and many other groups that make up community life. Once you find your ancestor’s address, you can map the shops, work, church, school, and social organization that are part of your ancestor’s life using the city directory. City directories are available at the Champaign County Historical Archives in the Urbana Free Library, but some can also be found on-line. Below are the city directories accessible on the internet website ‘Internet Archives’ at https://archive.org/. The Internet Archive website has different contributing libraries and entities digitizing text. 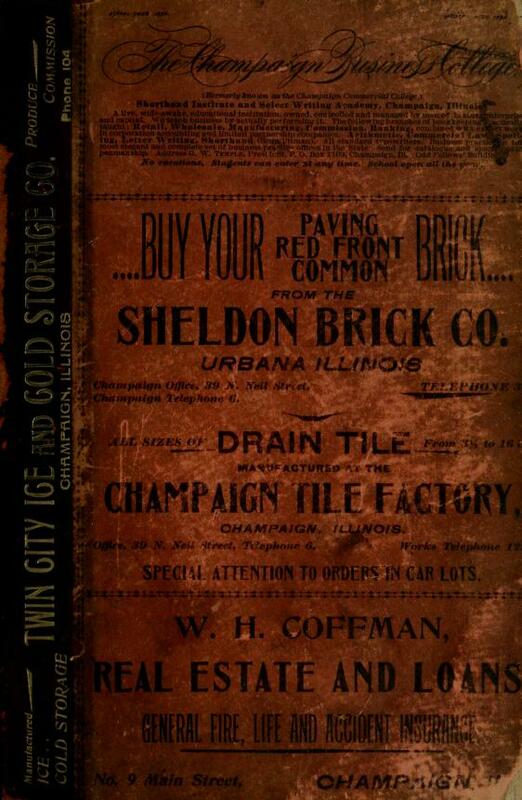 As a result, city directories are found by searching for the following two titles: “Champaign County directory” and “Johnson's Urbana-Champaign, Illinois city directory”. Listed below are the published years of the city directories that will result from each of the two searches. Despite being titled Champaign County directories, a few of the directories are Champaign County directories (marked with an asterisk *) and the rest are Champaign & Urbana with rural routes. Years Available: 1878-1879, 1885*, 1889*, 1898/99*, 1904, 1908, 1908-1909, 1915, 1923, 1924, 1926, 1928, 1929, 1930, 1931, 1932, 1934, 1939, 1940, 1941, 1942, 1943, 1944, 1945, 1946, 1947, 1948, 1949, and 1950. The directories alphabetically list residence and business for Champaign and Urbana plus rural route residence. 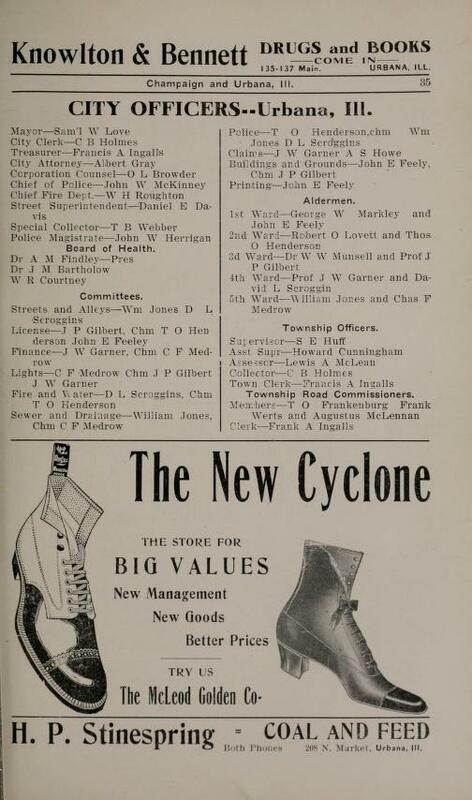 Additional highlights include advertisements and listings of societies, officials, churches, etc. Years Available: 1878-79, 1883-84, 1890, 1893, 1895-96, 1898, 1900, 1902-03, 1904, 1906, 1908, 1910, 1912, 1914, 1916, 1918, 1919-20, 1921, 1922, 1925, 1927, 1935, 1936, 1937, 1938, and 1940. 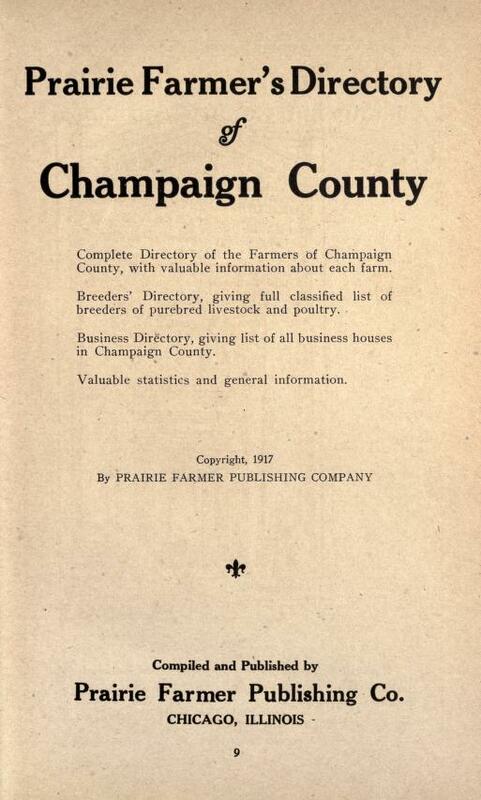 Prairie Farmer's directory of Champaign County: complete directory of the farmers of Champaign County, with valuable information about each farm; breeder's directory, giving full classified list of breeders of purebred livestock and poultry; business directory, giving list of all business houses in Champaign County; valuable statistics and general information (c1917).